A Taliban suicide bomb has hit an EU police vehicle in Kabul. One pedestrian was killed and five others were injured, though no one inside the car was hurt. This is the first attack by the Taliban in 2015 against a foreign target in the Afghan capital. According to a statement by the European Union Police Mission in Afghanistan (EUPOL), the car was packed with explosives and struck near the headquarters of the European police training mission in Kabul. The driver was apparently targeting a convoy of the organization’s vehicles in the east of the city, AP reported. "A EUPOL vehicle was involved in a vehicle borne suicide attack whilst it was travelling east on the Jalalabad Road in Kabul," the mission said in a statement, according to AFP. "The vehicle's occupants were uninjured," Kabul police spokesman Hashmat Stanakzai said. "Six civilians were wounded, one later died of his wounds in hospital." 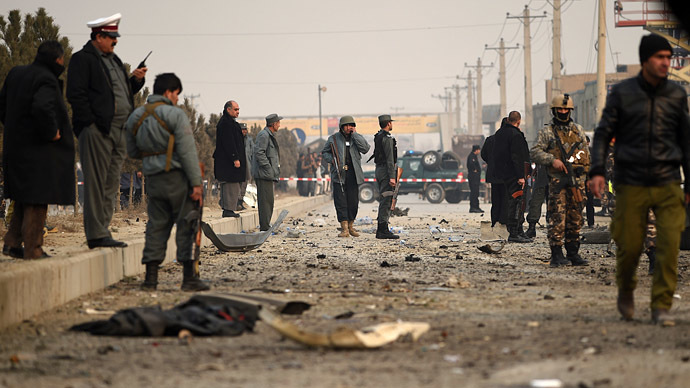 The bomb blast could be heard across the city and was the first major attack to take place in the Afghan capital in 2015, after NATO forces downgraded their role in the country from what was a combat mission, to now helping to support and train local Afghan forces. EUPOL, which was established in 2007, is also in Afghanistan in a support capacity. It is attempting to improve and train the country’s police force, which has in excess of 150,000 members. Kabul saw a spike in attacks during the final weeks of 2014. A total of six foreign nationals were killed as the Taliban targeted government, military and foreign instillations in the capital. Meanwhile, in a separate incident, an explosion took place not far from Kabul’s international airport, though no casualties were reported.